Born into an artistic family, Kerry’s love for communicating visually has been a life-long journey. Kerry’s love for the visual arts began as a boy when he would draw animals from the encyclopedia on rainy days and progressed to a love for photography. In 1984 he received a degree in Graphic Design and Print Production with a minor in Communication and Photojournalism emphasis from Bemidji State University in MN. 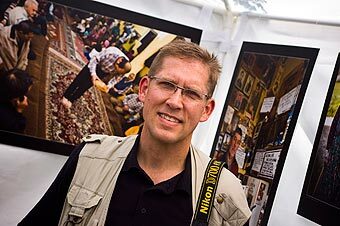 In 1996, Lammi received his MA in Photojournalism. As a photographer, Kerry Lammi is currently living in Antalya, Turkey. His travels and photography have taken him around North America as well as South America, Europe, Asia and Africa. Lammi has also worked as a visual communicator for over 30 years in the field of graphic design, printing & marketing. His specialty in design has been branding to help clients tell their story through a unified image. His goal is to promote peace between people of different cultures and ethnic groups through the use of photography and writing. Shari was born and raised in Southern Africa. She attended university in the U. S. A. During the winter holidays of her senior year, she went back to South Africa to visit her parents and on her return to the States she spent a week in Amsterdam where she met Kerry. They began a friendship through written correspondence and two years later were married in the States. That was over 25 years ago. Shari started off as an art teacher, but left it to give all her energy to raising their two children, mostly in Turkey. Their son now lives in Taiwan and their daughter now lives in the States. Shari loves to read, knit, practice hospitality, and cook. This blog is her first attempt at such a feat.